There is an increasing interest in strengthening and promoting different collaborative management systems in forestry practices. This is a response to societys demand for conservation and sustainable development of resources through effective participation and partnership arrangements. Local communities, living in or around forests, are often the key partners of the sustainable forest management practices since their subsistence economies and their welfare are highly dependent upon the forest resources. Approximately 17 500 settlements, where around 8 million people live, are designated as forest villages located in or nearby the state forests in Turkey. The State Forestry Service of Turkey has had the responsibility of taking measures to develop forest villages since the 1950s. A special fund called the Forest Village Development Fund and a lot of forest village cooperatives were created and a subject specific General Directorate was established in 1970. Forest Law 6831 (1956) provides employment privileges to forest villages and their cooperatives in forestry operations. Approximately, 500 000 villagers are employed annually in forestry practices. This paper presents some information on the scope of partnership in general and summarises the measures of the forestry sector to the rural communities in or around forests in Turkey. Strategies and means of development efforts are also examined, taking into account the new challenges and participatory approaches for sustainable management of forest resources in Turkey. Public demands for the social and environmental services of forest as well as for products will continue to increase and diversify. Therefore, the widening perception of the importance of forests and their role in the environment and the economy is becoming increasingly a matter of public debate. There is an increasing interest in strengthening or creating collaborative management systems as a strategy for promoting socio-economic development and resource conservation through empowerment and partnerships. In addition, decentralisation has increasingly ensured to efforts to turn over the responsibility and authority for natural resource management to rural communities. This has led to a re-evaluation of the role of professionals, projects and other institutions in helping this transition to occur. (FAO, 1999). The increasing number of partnership between forestry enterprises and institutions is a response to a changing environment. Because; the demands on forestry have become more diverse, timber production focused traditional forestry is losing its relevance to society; globalisation is putting intense pressure on timber markets and, all actors in forestry sector face constrains on financial and other resources (Timber Committee, 2002). In Turkey, although the forest villagers have no legal rights on the management of forests located around them, the forestry sector have given priority them for employment in all forestry operations. The forestry sector has provided a number of privileges to forest villagers on utilisation the state forests and special income from the state owned forest resources. This has created better relations and collaborative strategies in protection and sustainable management of forests. Interactions between the forest and people have been well tackled by the sustainable forest management which, deals with the social elements of the forestry debate. Public participation is an effective way of spreading messages to and of resource users and interested groups as well as raising awareness to promoting acceptance of forestry practices. Participatory development means projects or activities that are designed, implement, monitored, evaluated, adjusted through collaboration between the local people who will be affected and the institution that is supporting and promoting it. There are many ways for people to participate in decision making about the use of natural resources. Wide range of approaches provided in decision making processes that each influences differently the dimensions of participation from coerce, as the lowest level, to catalyse group decisions at the highest level (FAO, 1997 and 1999). The best public participatory management is based on mutual trust, improved communication and co-operation among all people involved in process. This may contribute to sustainable forest management by; increase public awareness among the public, maximise the total benefits of forests, assure sharing of costs and benefits in a equitable way and, enhance the social acceptance of sustainable forest management (MCPFE, 2002). Partnerships in forestry are often the result of an accepted, flexible and multiparty involved participatory processes that supports collaborative management between both the sector and others as well as within the sector itself. Partnership is the links between the forest service and selected stakeholders for carrying out simultaneous co-ordinated activities. In most cases, the term of partnership is especially used for designing some specific ways to implement common actions which are carried out and evaluated by both deciders and stakeholders (Butthoud, 2002). Partnership arrangements often differ in accordance with the areas where the basic forestry disciplines are the main concern (see figure below). Depending on the situation and in accordance with the relevant parts of the forest management processes, they may occur earlier or later - more or less frequently-in the decision-making or implementation cycle. In the local levels, land ownership, employment, harvesting, conservation, direct use of forest resources etc. are the predominant concerns while trade, self-consuming, marketing are the major partnership styles often occur in and out side the forest area. Broader issues of forestry dialogue often focuses on landscape, forest based industry, trade, scientific interest, research, biodiversity conservation etc. create more comprehensive levels of partnership patterns at national and regional levels in some degrees. Yet, in the global scale, issues such as climate change, carbon flow, air pollution etc. are the main concerns of the forestry debate. Apparently, many subjects may overlap each other and there are not certain boundaries among the areas of the arrangements but this is the general tendency that occurs in actual terms (Düzgün, 2002). The multi- beneficiaries aspects of forestry decisions should promote to set of different forms of partnerships with principles, contents and modalities that may differ from each other depending upon the partners and the issues to be addresses. 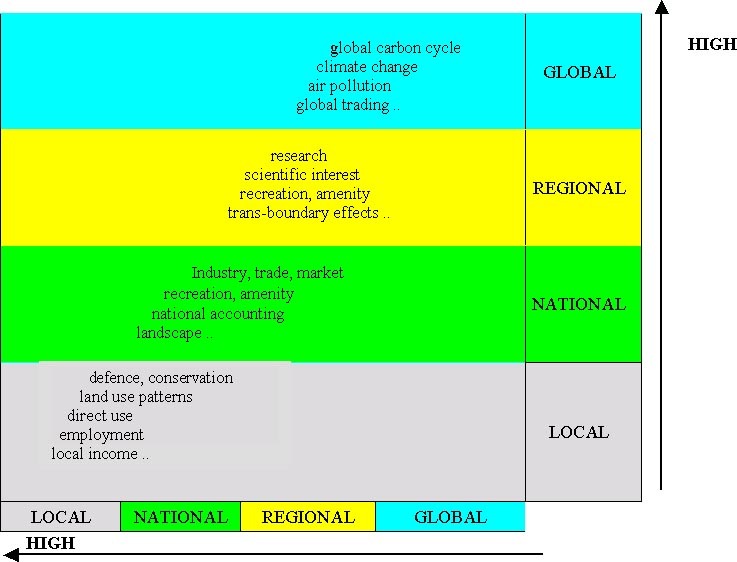 Different co-ordinated actions would be carried out in partnership in the framework of a global integrated approach at the level of which the coherence of sustainable management could be defined (Butthoud, 2002). Total forest area in Turkey is about 20.8 million hectares, which represents 27% of total countrys territory. Per capita forest area is around 0.35 hectares. 99% of countrys forest owned by the state. Forestry Sector in Turkey contributes only 0.8% to the GNP but this excludes the indirect and intangible benefits of forests. 51 percent (10.6 million hectares) of total forest is designated as productive forests while the remaining 49 percent (10.2 million hectares) is made up degraded forests, rangelands and eroded areas which of those represent unproductive forests. According to the latest figures, there are about 7.5 million people living in more than 17 000 villages in or around state forest in Turkey. Communities settled in or around forested areas, named forest villages, represents 11% of the countrys total population. The living standards of these communities have always been remained under the countrys averages and their survival greatly depends on the forest resources since there are scarcity of alternative employment and difficulties in accessibility to other facilities. Poverty generally place severe stress on soils, cutting trees and villagers have often encroached on forest lands and shifting forest land to poor arable agricultural land. Forest villagers constitute the major partnership schemes in Turkeys forestry. Due to their poor life standards, numerous historical, social and natural factors and the increased basic needs of these people, broad and direct relations have always come into existence between the forestry organisations and the forest villagers. A great number of stakeholders have an important influence on the forestry sector. These include particularly forest villagers, farmers and grazers as well as the wood-consuming industry, urban dwellers. The Forest law 1316, came into force in 1937, mainly consisted of the provisions for exploitation, harvesting and strong protective measures of state forests particularly against local people. In 1956, the new Forest Law 6831 came into force, brought a number of new approaches that ensure people get involved in forest management in many ways. Recently, the Ministry of Forestry, Turkey has executed several foreign financed projects that focus on participatory approaches and methods. Projects such as Development of Appropriate Community Forestry Models in Turkey, Forestry and Food Security in the Mediterranean Region, Eastern Anatolia Integrated Watershed and Bio-diversity and Natural Resource Management are the remarkable ones. Project named Preparing National Forest Programme (2002-2202), assisted by FAO, focuses mainly on development of the participatory approaches of all interested parties through appropriate workshops and training programme being organised. Subsidies: Turkeys forestry service felt that forestry sector, should support and generate some improvement measures for these people so as to get a sustainable balance for the maintenance of the forest resources.In Turkey, all forest villagers are being subsidised not only by employment opportunities but also through providing wood for construction and fuelwood for their own needs with highly discounted prices by the Forest Law. In this content, about 8 million cubic meter fuelwood and around 400 000 cubic meter construction wood are being given to forest villagers annually. This amount refers approximately US$ 170 million as a yearly subsidy (WB, 2000). (ii) Non wood Forest Products (NWFPs): NWFPs create significant job facilities and income for the forest villagers and their co-operatives. In accordance with the Forest Law, villagers have some privileges for collection of NWFPs in state forests for use and selling. Villagers, co-operatives and their special associations have been encouraged and supported by forestry service for domestication and cultivation some of the wild plants in their lands. Through these initiatives, there are some small-scale, co-operative based NWFPs processing plants and factories for established. (iii) Free grazing and fodder production in or around state forests is often tolerated by forestry sector as traditional land use patterns. Livestock is one of the main income and job creating activity in forest villages. In accordance with the forest and rangeland management plans, common grazing is supported more than individual. Thus, co-operative and collaborative resource use, in accordance with the technical measures, would create positive relation between the State Forest Service and the villagers. Pasture betterment projects are being implemented by the Forestry Service for increasing fodder capacity of pastures in or around forests. (iv) Employment, in forestry based operations in the state forests, is another important contribution to the people living in forest villages which, and is given by the Forest Law as concession. It creates relevant partnership and co-operative forest management strategies. Protection, harvesting, transportation, nursery, plantation establishment, national park management, erosion control etc. are the basis field works of forestry activities in which forest villagers and their co-operatives are employed. Approximately 140 000 labour are being employed annually by the forestry service. In this respect, special articles of the current forest law 6831 were introduced and being amended whenever is needed in favour of villagers and more and more rights and opportunities are being devoted to them. (iv) Socio-economic based contributions: Credits and grants provide through Forest Village Development Fund for the development of the forest villagers. Various small-scale income generating activities (bee keeping, animal husbandry, diary production, carpet weaving, iron roof for buildings, energy saving stoves etc.) are the more commons. The fund is financed by the forestry sector through its revenue from the forest products. Thus, forest based revenue go back to the areas of origin where came from. This circle creates a promising relationship as well as effective partnership between forestry sector and the villagers. These contributions that committed to forest villages, also prevent more or less out migration of villagers. (v) Joint Forest protection Practices between Forestry Sector and Villagers: Turkish state forestry service recently launched a new initiative that provides better approaches on sustainable protection of state forests. Official protocol signed by local forest authorities and the village community as a joint forest protection mechanism against harmful affects in the natural forests, newly planted areas and the wildlife resources. Through this arrangement forest villagers officially in charge of protection responsibility on the state forests into their administrative boundaries. This initiative is creating both extra incomes to forest villagers and a better awareness for protection and maintenance of state forests. Villagers are becoming considered as though the state forests are their own resources. - The Chamber of Forest Engineers (OMO) and Association of Turkish Foresters (TOD). They are the major NGOs as professional associations of foresters. They are directly dealing with forestry subjects, in terms of the forestry problems and the problems of forestry professionals as well. - Turkish Development Foundation (TKV), specialised in rural development, poverty alleviation and socio-economic field surveys on remote and rural areas since 1969. The TKV has also carried out projects, research, training activities on poultry, handicrafts, bee keeping etc. mainly in rural areas in co-operation with other related organs. The TKV is also conducting a number of projects together with the forestry service. - Association for protection of Natural Resources (DHKD), as a member of WWF and mainly involved in protected area management, biodiversity, wildlife, conservation of endemic species etc. It recently made contact with forestry service to implement several projects on related fields. - Turkish Foundation for Combating Erosion, Forestation and Conservation of Natural Habitats (TEMA). The objective of this NGO is combating erosion, reforestation, environment, and public awareness, project implementation on these fields and countrywide environmentally related training. The TEMA is also financially and technically supporting some forestry based projects. - Foundation for the Protection and Promotion of Environmental and Cultural Assets (ÇEKUL). It was founded in 1990 aiming at to promote environmental and cultural values through project implementation, education, public awareness organising meeting and seminars, tree planting activities and national/international co-operation on these subjects. - Foundation for the Protection of Turkeys Nature (TTKD), founded in 1955. The main objectives of this NGO are promotion of public awareness on the conservation of wildlife and other natural resources by training, publications, campaigns etc. The TTKD has also organised meetings, conferences, panels, etc. on related subjects. e.g. domestic and/or wild animal species birds etc. some are active all environmental matters. - Many important changes in forest policy have taken place due to the increased and diversified needs of society whereby environmental and social aspects of forestry and more interest of local communities are becoming the key issues of sustainable forest management. - Some part of society like village dwellers inside forests should have the right to get involved in forest management and decision making processes nearby. Then effective and efficient participation and partnership could be achieved. Besides, there should also be good balance between the responsibility to be committed and profit making from the same resources being managed. - Basic mechanisms for participation in forestry should be strengthened so as to mobilise public interest both in education and in the field. Forestry education should focus on dealing with people rather than with trees for much of their time. - Institutional improvements and innovations highly appreciated by forestry authorities in Turkey. Approaches therefore led many changes and amend made on forestry regulations in order to fulfil the needs and expectations of forest villages through economically and socially adaptable and environmentally sound measures. (v) Effective participation mechanisms and partnership arrangements could not be achieved without institutionalisation and legalisation needed. Butthoud G, 2002; Developing partnership between forestry agencies and stakeholders; The mixed model as a strategic planning tool, Seminar on partnership in Forestry, Brussels, Belgium, 3-6 June 2002. Düzgün, M. 2002. Contribution to the Forest Dependent Rural Communities through Partnerships in State-Owned Forestry Administration in Turkey, Partnership in Forestry Seminar, Brussels, Belgium, 3-6 June 2002. FAO, 1999. The Participatory Process for Supporting Collaborative Management of Natural Resources: An Overview. FAO, Rome. FAO/ECE/ILO Joint Committee, 2002. Report of the seminar on Partnership in Forestry, Brussels, Belgium, 3-6 June 2002. ILO, 2000. Public Participation in Forestry in Europe and North America. Report of the FAO/ECE/ILO Joint Committee Team of Specialists on Participation in Forestry. Sectional Activities Department ILO, Geneva. PMCPFE Paper 2, 2002. Public Participation in forestry in Europe and North America, Synopsis. Ministerial Conference on the Protection of Forest in Europe (MCPFE). Liaison Unit Vienna. UN-ECE, 1998, Timber Committee YearBook, Timber and Forest information series ECE/TIM/INFO/5. World Bank, 2000. Turkeys Forestry Sector Review 2000.